Bear Lake State Park is a state park of Utah, USA, along the shore of Bear Lake on the Idaho border. It offers three recreation areas: Rendezvous Beach, Bear Lake Marina, and East Side, which comprises several more segments. The park also hosts many annual events, such as a Mountain Man Rendezvous and Bear Lake Raspberry Days. Recreational activities include waterskiing, swimming, scuba diving, and sailing. Anglers enjoy year-round fishing for cutthroat trout, mackinaw trout, Bonneville cisco, and whitefish. The East Side portions of the park consists of six primitive camping sites and two concrete boat ramps. From the south end of the lake, about one mile up is and First Point 41°52′34″N 111°17′44″W﻿ / ﻿41.8760359°N 111.2954776°W﻿ / 41.8760359; -111.2954776﻿ (First Point) with a boat ramp. 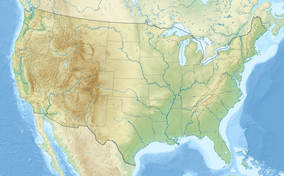 Then 2 miles further begins the Cisco Beach area, which runs approximately three miles from South Eden campground at the south to Rainbow Cove on the north 41°58′14″N 111°16′14″W﻿ / ﻿41.9706725°N 111.2704647°W﻿ / 41.9706725; -111.2704647﻿ (Rainbow Cove). And one mile further north, is the North Eden campground, at the Idaho border. ^ "Maps | Data Basin". databasin.org. Retrieved 2018-12-29. ^ a b "Bear Lake State Park: About the Park". Utah State Parks. Archived from the original on 16 March 2011. Retrieved 2011-02-04. ^ "Utah State Park 2011 Visitation" (PDF). Utah State Parks Planning. Retrieved 28 May 2012. ^ "Bear Lake State Park". Utah State Parks. ^ "Bear Lake Camping and Picnics". Bear Lake Convention and Visitors Bureau. Archived from the original on 2008-12-01. This article incorporates public domain material from the Division of Utah State Parks and Recreation document "Bear Lake State Park: About the Park". 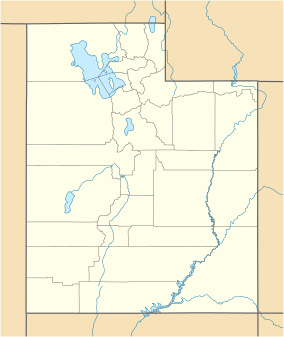 Wikimedia Commons has media related to Bear Lake State Park (Utah).